Federal Communications Commission Chairman Tom Wheeler said the agency will consider in July a proposal to open space on the spectrum for fifth-generation wireless. 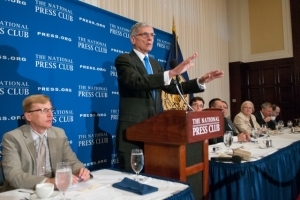 The Federal Communications Commission (FCC) plans to vote on a proposal next month that will open up a large swath of spectrum for fifth-generation wireless, or 5G, FCC Chairman Thomas Wheeler told a National Press Club Luncheon June 20. Wheeler plans to circulate his “Spectrum Frontiers” proposal to his fellow commissioners on June 23, he said. It is common for the FCC chairman to distribute items a few weeks before a meeting to allow the members of the commission to negotiate before the vote, which is scheduled for July 14. Even though the proposal is widely seen as creating rules for 5G wireless, Wheeler was emphatic that if the FCC adopts his Spectrum Frontiers proposal, the agency will provide space rather than promulgate regulations for a technology that does not yet exist. Because some of the spectrum is currently used by both the satellite industry and the federal government, Wheeler plans to propose a sharing regime, he said. “We will strike a balance that offers flexibility for satellite users to expand, while providing terrestrial licensees with predictability about the areas in which satellite will locate,” Wheeler said. Fifth-generation wireless will enable the Internet of Things to become a reality but “it has to be fast, it has to be latency free and it has to be secure,” Wheeler said. By making the spectrum available, Wheeler believes the United States will remain the leader in the development of wireless technology. He warned, however, that anyone who says they know what technology will comprise 5G is wrong. “Innovation is always about unanticipated applications,” Wheeler said. Wheeler led the wireless industry’s trade association, the Cellular Technology Industry Association, from 1992 to 2004. During that time, he saw firsthand that expectations of how technology would develop were often wrong. “We have always underestimated the innovation that would result from new generations of wireless networks,” Wheeler said, noting that in the early 1980s McKinsey told AT&T there would be 900,000 cell-phone subscribers by the turn of the century. There were 109 million. No one anticipated that when second-generation wireless added voice to text that there would be a banking revolution in the developing world. Third and fourth-generation wireless incorporated the internet into handsets but nobody expected the explosion of applications that are now a part of everyday life, such as Instagram or Uber.